On Spanaway Lake. 2BR/2.5Bath+Den. Garage & Carport. Huge Deck and Lanai. Updated. Laminate floors, Gas FP & Range, DW, W/D, Fridge, Freezer, Pool, Tennis Ct., 2 boat docks, clubhouse, gated community, plus more. Minutes from base, golf course, park, and shopping. Includes basic cable, H2O, Sewer, Garbage. 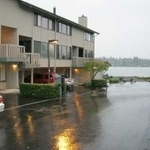 Lakeside living at it's best, a must see! Available 8-15-12 for move in.